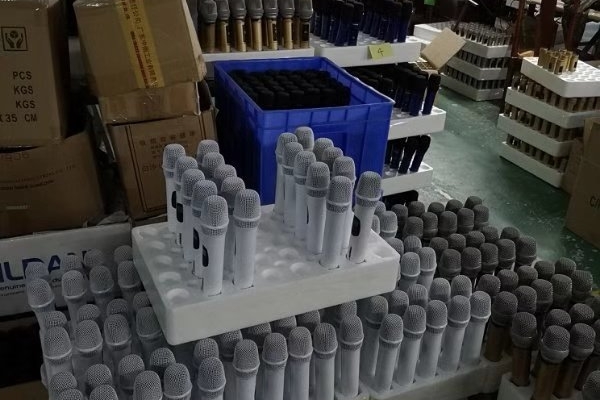 A raid on a factory in China has uncovered counterfeit Shure, Sennheiser, Yamaha and Harman products including wireless microphones and receivers, consoles, amplifiers and processors. The operation was instigated by Shure and centred around an operation last October at a factory in China operated as Enping Soundpu Electronics Equipment – also known as Voxpu Electronics Equipment – that has only now been made public. Shure has taken steps towards criminal prosecution against the owner and managers of Soundpu based on the outcome of the raid, and will be assisted by Sennheiser, Yamaha and Harman. The Soundpu/Voxpu is said to be a repeat offender on counterfeiting and known to the local authorities, having already been fined by the Enping Administration of Industry and Commerce (AIC) after counterfeit Shure wireless microphones were found at the factory during a routine market investigation carried out in April 2018. “Counterfeiting is an ongoing problem for the audio industry, and we remain vigilant in our anti-counterfeiting efforts,” said Chris Schyvinck, Shure's president and CEO. “Counterfeit products do not just exasperate customers by delivering a bad experience that does not reflect the promise of the brand,” added Daniel Sennheiser, co-CEO of Sennheiser. “Yamaha has long taken various measures against counterfeit products such as civil actions, police raids, suspensions from customs, and placed enlightening advertisements globally, particularly in China,” said Takuya Nakata, president and representative executive officer of Yamaha.